Over the summer and fall, I was getting 10-13 eggs per day from my 14 hens! Now, though, the winter’s low light has dropped them back down to 2-6 per day. Still, I’ll take it. They’re a joy to have and provide endless entertainment value. The roosters have become a bit more crotchety and protective, but they’re still not bad boys on the whole. You just have to keep an eye on them if you’re really close to them and wearing big, scary boots. Our little kitten is no longer so little, although she’s small for an adult cat. She still enjoys rampaging throughout the house, mixed with periods of extreme cuteness. This year’s deer hunt resulted in a nice doe. 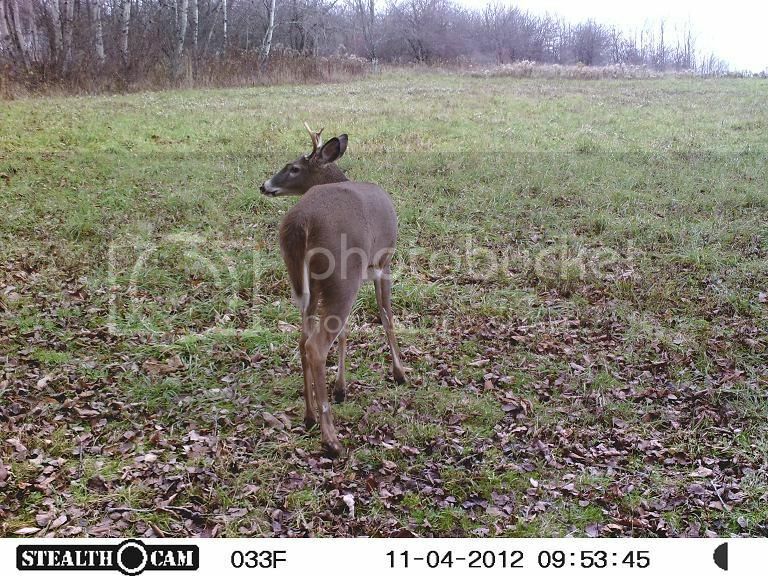 Prior to that, I bought a trail camera for getting wildlife photos on my property. We got a lot of nice ones, but it was also pretty promptly stolen by someone trespassing in our fields. People seem to continually disappoint me in such matters. A police report yielded nothing so far. Somewhat happily, though, the winter has been mild thus far, which makes it easier on the animals and me. Lower bills, less worrying about the chickens, more greenery to lighten my mood… I’m sure ski resorts and snowmobilers hate it, though. It remains to be seen whether we’ll have the same (nonexistent) winter of last year, or if it will get more gnarly as the season progresses. The growing season mostly ended a bit early this year. Many crops were done in mid-September, either succumbing to disease or falling victim to a light, early frost that came on Sept. 16th. Most of the rest finished in early October, when a killing freeze claimed them. For now, I still have plenty of eggs and maple syrup for sale. I’ll be making new syrup in another month or two, though last year’s has been stored cool, sealed, and dark, and is just as good as it was when I made it. I also have red and white potatoes still, as well as some onions. The kale is still going strong out in the garden, shrugging off temps in the high teens and low 20s as it always does. I highly encourage growing this plant. It’s so tough, and so nutritious besides! I no longer have beets, because rodents got into them and apparently ate around 2 bushels worth of them. There are always little troubles, but oh well – we keep on. Such is life. I got the first egg from one of my Gold-laced Wyandotte hens a little over a week ago. Now another unknown Wyandotte has joined her in laying, and two of the Easter Eggers have as well. Yesterday was the best day for eggs so far – we found 4 in there, 2 brown and 2 blue. I have yet to find out exactly who the other 3 layers are. My Silver-laced Wyandotte rooster, Sigurd, gives an antsy, squawking alarm when a girl is about to lay, causing us much amusement. They’re all little pullet eggs right now, but they’re already getting a little bigger compared to the first ones. Harvesting is in full swing. Zucchini/summer squash and green beans are overwhelming me as usual. I just dug the Red Norland potatoes today, and while yields were poor compared to what I was expecting (I blame the drought), I still ended up with more than last year, so I’m not too displeased. Broccoli also did well. I have harvested all the first heads, so now only side shoots remain, but one of the first heads was measured out to be 14″ wide. This is 3″ wider than my old record, which was itself a gigantic head of broccoli. They were truly something else. The pot is a 3 gallon tree pot. Tomatoes are also coming ready fast, and I’m picking more and more every day. I’m impressed with Cherokee Purple, but I’m also eager to see how my heirloom Mr. Stripeys look when fully ripe. Other veggies like peas, lettuce, and cucumbers are also producing, though the former two are on their way out. Watermelons seem really good looking this year, and I can’t wait to try some of the orange-fleshed ones I planted. Acorn squash are forming on their vines, and I’m still hoping for a good-sized pumpkin, too. So far, roadside sales have been poor this year, and I’ve had trouble moving my produce. I’ve joined up with Furniture City Foods to offer some of my stuff online, and I got my first order this morning. I’ll fill that, and maybe business will pick up. Maybe not. I’m also dabbling with possibly getting into a produce market in Jamestown, but I don’t know if that will happen or not. I think the best thing for my sales will be to have a shed/stand to sell out of. Maybe next year. The trees and gooseberry/currant bushes are all still alive, though some look better than others. The heat and dry weather have been hard on them. I lost some of the raspberries, but if some survive that will be enough to do cuttings from, or they’re cheap enough that I can just replace them if need be. I do hope that all the trees make it, though. Hay season is complete, with enough extra bales made to get the chickens through the winter with plenty of bedding. … and my corn, happily, beat the old saying by a long shot. They say you should shoot to have it knee high by the 4th of July. Well, mine is around chest-height in some spots, but all of it is over my waist. It is thriving in the hot weather, and now that we got a good soaking from a ‘gentle’ thunderstorm last night, I am sure it will shoot up even more. The tomatoes are approaching 5 feet in height and vining profusely. Some are so heavy already that they are already close to knocking over their cages, so we will probably have to do like last year and make a framework for them to lay on. Radishes are all ready, and lettuce is getting there. Herbs are getting ready as well. It won’t be long for zucchini, as they are in flower. It won’t be long for early tomatoes either. They are loading up with green fruits in huge clusters of 8. I can’t wait to see what they look like when they ripen. The Wyandotte rooster has been named Sigurd. He has started to crow, but doesn’t know the whole song. He sings ‘Ca CAAA caa’ instead. :] So far, he gets along with Chanticleer for the most part, but he seems to be getting really out of control and rough with the girls so he may end up in a stewpot yet. I hope he improves – he is a pretty boy and would be great for producing more chicks. It’s been overall dry and very hot here. Some things are loving it, like the peppers, but others (beets, carrots) are despising it and are struggling. Hopefully it all evens out in the end. Some more young trees have sprouted from pits. There’s a plum and 3 more peach trees now! The big trees we put in have taken some bad deer damage but are still holding on. Hopefully they can establish and come back next year for some good growth. Our fields have been fully cut. The biggest customers are satisfied, but we don’t have enough for the last ones, so we have had to find fields in other nearby locations to cut and bale. Good problems, I guess. I project that I can start roadside sales in another 2 weeks if all continues as it is. Might be sooner, might be later, but I think that that is close to what should be expected. I’ve been selling a few jars of maple syrup here and there, waiting for the growing season to begin. I am looking at a mid-May planting date, like I usually do. I could put in some crops earlier, such as kale, peas, or onions, but it is easier for me to simply cultivate the land and plant it all in one go. The seeds are all purchased for the most part. I will just be purchasing some started plants for things like tomatoes and broccoli. I picked up 16 more raspberry starts, 8 black and 8 red, at the Frewsburg spring consignment auction. This is added to the 5 raspberries and 4 blackberries we already have, so we should get a pretty good little bush of them established if they all survive and so forth. I also purchased 8 grape vines, but they were severely nipped by a hard freeze on a night it wasn’t expected, so they have yet to recover. I will have to just wait and see on those. I plan to order some other small fruits like gooseberries and also some fruit trees to put in if everything permits. It may get partially put off to next year, but it will happen. The chickens are still growing fast! They are around 6 weeks old now, and are getting fully feathered. These are pictures from a little over a week ago, so they’re even bigger and more feathered now. Their coop has also seen big progress. They are outside in it now, and have been for around two weeks. We still have yet to put the wire run on the front of it, and the next boxes onto the back, but it is secure and liveable for them, which is the main thing. They won’t start laying for another 3-4 months, and we have a little time before the run becomes more necessary, but they are definitely way too big to be in the house anymore! Those little buggers in the previous post look a lot different now, and they’re still growing… fast! and they really love kale. Which is fine with me, because it’s the one vegetable that was hardy enough to survive the entire winter with no protection whatsoever, and can be harvested fresh and given to them as a treat a few times a week. They go nuts – the little gal in the above photo will even run up to me now. The season for wild leeks/ramps is now here. I picked a bag full of small plants last week so I could sample them. We made some nice leek-y mashed potatoes, with plenty of leftovers. The flavors got much stronger the second day, as leeks can do! They’re versatile, and the whole plant can be used like onions or garlic. We’ll be using them for a while, munching them on our woodland walks, and possibly drying some for the off season. Plants are now getting to be of better size and are available by the pound to those interested. Just contact me. $10/lb. currently, but price will vary depending on the size and quality of plants at the time of order. It will fall as leeks get larger. Yes, I can do half pounds, or quarter pounds. A little does go quite a long way. Sold uncleaned/as dug condition (clumps of dirt removed, but roots and clinging small debris/surface dirt may remain). Leeks have a nice little ‘skin’ you can slip off, though, which takes care of most of the cleaning! They are sustainably harvested by using a dandelion digger, taking only a few plants per group. They are available only for a limited time and quantity. I will never shovel up huge clumps or pick from any of my dozens of colonies to the point that they look sparse. This is only offered for enjoyment – I don’t intend to make a big profit off of it! Pick up on farm only. Please contact me with your interest, and I will get back to you as soon as I can. Leeks are picked fresh upon order; no stock is maintained. Sorry, no delivery or shipping. Yesterday, we got our shipment of 15 day-old chicks. I got them from Mt. Healthy Hatchery, which was recommended to me when I was pricing supplies. I would’ve gotten chicks locally, but I specifically wanted Wyandottes, and I have yet to find someone around here that has them to sell to me. I put in for 5 Golden Laced Wyandottes, 5 Silver Laced Wyandottes, and 5 ‘Easter Eggers’, which are basically a mutt breed of chicken that lays colored eggs (pale blue or greenish, usually). Both breeds are good to very good layers and are also large enough for meat purposes if desired. They are also supposed to be very cold tolerant and have good/fun temperaments. They are currently under a heat lamp in my makeshift brooder, and all seem to be vigorous, eating, drinking, and doing just fine. I’ve wiped off a few fluffy butts just to make sure they don’t get caked up, but other than that there are no issues. Fingers crossed.